Nabulsi Cheese authentic White Brined Cheese spelled also Naboulsi with spices and nigella seeds called sometimes black cumin seeds is the real Middle Eastern cheese denoting Nablus, its place of origin in the West Bank. Karoun brand cheeses are now produced in USA following Middle Eastern traditions from first quality cow milk under the supervision of KAROUN DAIRIES S.A.L. according to its strict quality standards and distributed by KAROUN DAIRIES INC. Middle East specialty cheese Company. KAROUN Nabulsi cheese is a smooth, semi-firm unripened white cheese rectangular in form. 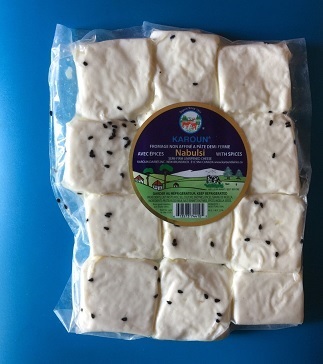 KAROUN authentic nabulsi cheese is salty as most Middle Eastern specialty cheeses. 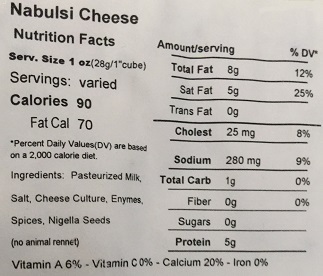 Nabulsi cheese is a boiled cheese. It squeaks between your teeth and is served with a simple smattering of cucumber and tomato to balance the salt of its traditional brine.It is suitable as a table cheese, in sandwiches, salads and in cooking. It can be grilled to a golden crust. It is sold under KAROUN or MAYAR brands. Shelf Life: 6 months refrigerated 20-70 C.